Pickens is included in the Winter Storm Watch in effect on Tuesday, January 29th from 3 AM - 7 PM with the potential of accumulating snow. Up to 2" of snow is expected within the watch area with localized higher totals possible in far North Georgia and higher elevations. The following have announced closings tomorrow. 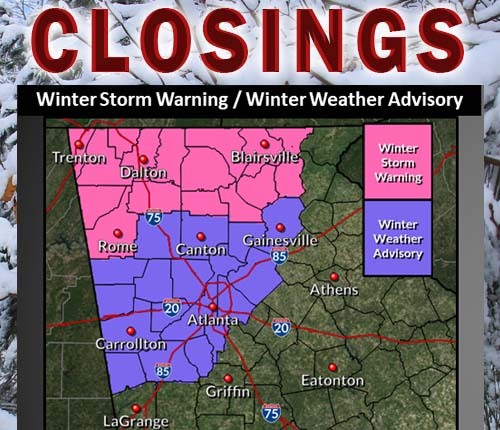 Pickens County School system issued their Inclement Weather Policy on Friday. Make sure information is updated with the system. Snow: Up to 2" of snow is expected within the watch area with localized higher totals possible in the higher elevations of north Georgia. Black Ice: Black ice will be possible even in areas that receive little to no snow accumulation as temperatures drop below freezing through the day Tuesday but especially Tuesday night into Wednesday. Wind Chills: Wind chills will drop into the low to mid teens across much of the area with single digits expected in the North Georgia mountains late Tuesday into Wednesday morning. Gusty Winds: Winds will rapidly increase behind the cold front during the day Tuesday and persist into Tuesday night. Expect northwest winds around 15-20 mph with gusts up to 25-30 mph.